Consumers don’t expect brands to be flawless. 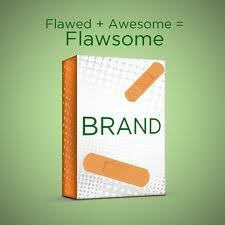 In fact, consumers will embrace brands that are FLAWSOME: brands that are still brilliant despite having flaws; even being flawed (and being open about it) can be awesome. Brands that show some empathy, generosity, humility, flexibility, maturity, humor, and (dare we say it) some character and humanity. HUMAN BRANDS: Everything from disgust at business to the influence of online culture (with its honesty and immediacy), is driving consumers away from bland, boring brands in favor of brands with some personality. TRANSPARENCY TRIUMPH: Consumers are benefiting from almost total and utter transparency (and thus are finding out about flaws anyway), as a result of the torrent of readily available reviews, leaks and ratings. ← Engineering Happiness: Is There an Easy & Foolproof Way to be Happy?